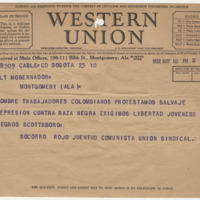 Telegram from Socorro Rojo Juventud Comunista Unión Sindical in Bogotá, Colombia, to Gobernador in Montgomery, Alabama. 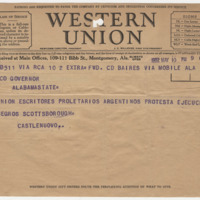 Telegram from Unión Escritores Proletarios Argentinos in Argentina, to Governor of Alabama. Unión Escritores Proletarios Argentinos (Argentine Proletarian Writers Union) protests the execution of the Scottsboro Boys after the 1932 Alabama Supreme Court decision to uphold the lower court's 1931 conviction and sentencing. 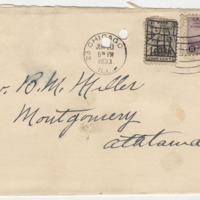 Telegram from First Siberian Broadcasting Station in Nowosibirisk in Novosibirisk, Soviet Union, to Governor Miller in Montgomery, Alabama. 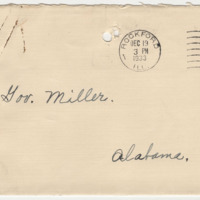 Telegram from American Engineers Specialists Workers in Moscow, Soviet Union, to Governor Miller in Montgomery, Alabama. 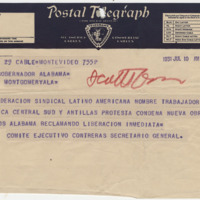 Telegram from Confederación Sindical Latinoamericana in Montevideo, Uruguay, to Gobernador Miller in Montgomery, Alabama. 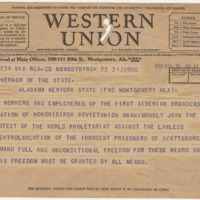 Resolution from Unemployed Councils, Branch 1 in Rockford, Illinois, to Governor Miller in Alabama. 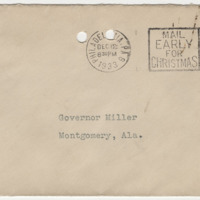 Resolution from employees of Pennsylvania Dye Works in Philadelphia, Pennsylvania, to Governor Miller in Montgomery, Alabama. 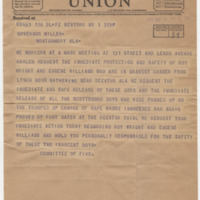 Resolution from workers in Chicago, Illinois to Governor Miller in Montgomery, Alabama. Workers in Chicago ask for the release of Eugene Williams and Roy Wright before their June 22, 1933 Juvenile Court trial in Decatur. 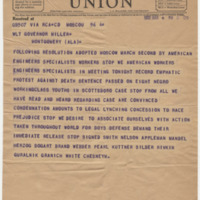 This is one of many similar form resolutions on this subject in the archive.